Captured by a creature unknown, you must now find your way through the weird and horrid underground to find your way back home to your family. Solve mindbending puzzles using very easy controls to navigate your little character. Use your environment to your advantage by manipulating objects with your powerful tractor beam. *Gamepad compatible, but menu still require mouse. Unmechanical is a sidescrolling puzzle game using 3D graphics.The game was developed in UDK by five students from Futuregames during a time period of four weeks. Fun indie games are always evolving. If you're searching for the latest in indie gaming, look no further than the Evolved Bundle from Indie Royale. It will give you hours of enjoyment and includes some great recently released games. Featured in this bundle are 5 indie titles, valued at over $55, including last summer's highly rated puzzle solving adventure from Talawa Games, Umechanical; an atmospheric horror game from Tale of Tales, The Path; the recently released squad based dungeon game, Krater from Fatshark; the full game of the IGF China 2010's winner, Sugar Cube: Bittersweet Factory from Turtle Cream; and an intricate scrolling puzzler, OIO: The Game from Uncanny Games. All of the games in the Evolved Bundle are new to game bundles! First up is the tricky, award winning, puzzle adventure game Unmechanical, available for Windows on Steam, Desura & DRM-free. It was developed by Talawa Games and is offered thanks to Teotl Studios. 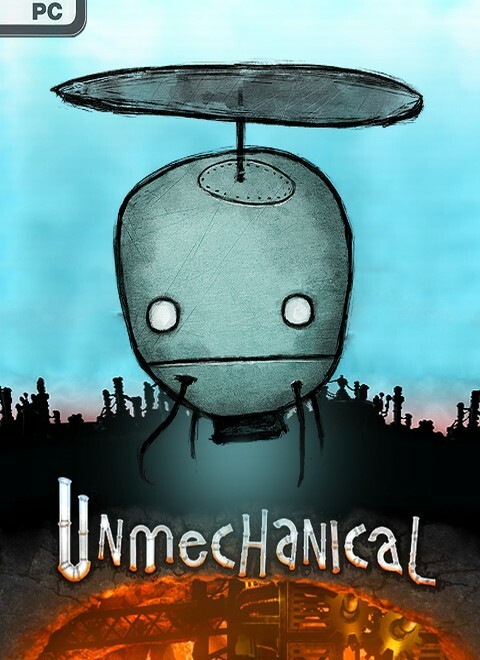 Unmechanical was only released in August 2012. You will explore an atmospheric world of flesh, rock & steel, journeying to freedom through a variety of puzzles with some very difficult challenges later in the game. Rock, Paper Shotgun called it "a near-perfect morsel of puzzling brilliance". Next is The Path from Tale of Tales. A horror game that relies on your imagination, available for Windows from Steam, Desura & DRM-free. There's a Mac version in there too. The Path is a game about choices and wolves in the woods! Gamespot said it was "an extraordinary work of interactive fiction". Play the game but be careful if you stray from the path! The Evolved Bundle includes the game's OST from rock diva Jarboe. Also featured is the recently released real-time squad based dungeon crawling game Krater, available for Windows Steam, from Fatshark. The game features fast paced combat, tactical squad management, crafting and questing all from a classis RTS perspective. It's set in a post-apocalyptic Sweden and includes the specially designed online co-op dungeons & bosses. The Evolved Bundle also includes the Character DLC. The next game in this evolutionary bundle is Sugar Cube: Bittersweet Factory from Turtle Cream, available for Windows from Steam, Desura & DRM-free. This game is the full version of the IGF China's 2010 winner, Sugar Cube, including the OST. It's all about avoiding becoming a cookie! Multiple endings and achievements give the game a lot of replay value. Indie Game Magazine said "Sugar Cube presents a short, sweet, mind-working, challenge". Last up is the nature themed scrolling platform puzzler OIO: The Game from Uncanny Games, available for Windows and Mac from Desura & DRM-free. It's simple but intricate and, with a metacritic of 75, it's definitely worth your time! Gamepro says of OIO "difficulty doesn't take long to hone itself to a sharp point" whilst IGN says it has a "truly gorgeous art style". OIO is in Steam Greenlight right now so don't forget to upvote it if you like this game. Finally, those who pay $8 USD or their currency equivalent during the Evolved Bundle will get an ambient electronic treat from Tim Wright of CoLD SToRAGE, the recently released 'SLIPSTREAM [volume 1]'. The album features 64 bit digital re-mix / re-masters of Tim's tracks from WipEout and WipEout 2097. Each track has been painstakingly E.Q. 'd, compressed and spatially enhanced for the best possible listening experience. It's been a long time coming - we hope you enjoy it! You can find more information on the Evolved Bundle, including real-time statistics and its current price, on its official website or via its Facebook and Twitter pages. Grab this bundle now while the price is still low (unless kind purchasers lower the price) so that you'll have hours of indie games to evolve your skills with! A puzzle adventure that combines tricky puzzle solving, alluring exploration, and an engrossing atmosphere. We're working on fixing the Unsetup problem! Thanks for the answer! I'll be waiting for it! Thank you! All fixed now - enjoy this most excellent game! Yeah all working now. Played my first hour of the game. Pretty cool but Puzzles are a way to easy, hope it will get harder. Thank you very much! Indeed the game works perfect now and I'm enjoy in it! Same issue, UnSetup is missing. also not starting, same problem as posted by other users before. "I can't play it. Is it just me? Keeps telling me that UnSetup.exe is missing, in fact I couldn't locate that executable." same for me.